Anne Vencill’s academic background and training is in the Sciences. 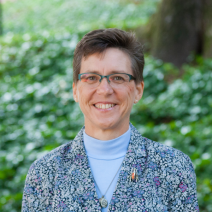 She holds Doctorate and Master’s degrees in Entomology from Virginia Tech, as well as a Master’s in Educational Leadership from Marymount University and a Bachelor’s degree in Biology from the University of Mary Washington. In addition to working at UGA and having a passion for insects and other invertebrates, Anne also enjoys quilting, baking, knitting, and reading. Dr. Vencill has five children: three attending college (two at Georgia Tech, one at UGA) and two in high school. She joined the Office of Academic Advising in 2014 and she advises science students in Memorial Hall. You can contact Anne Marie Vencill at her email, amvencill@uga.edu, or by phone, at (706)542-1412.